Wanna compare your GS2 to another Android phone ... or even *cough, cough* an iPhone? Well, here's the place to do it! Please keep the discussions civil (no flaming, cursing, etc). Have at it!! Thanks to Ollie for suggesting this thread! Ollie and thirdcoastraised like this. When we find dog fights on our favorite android sights shall we pot the links or do you want this personal experiences? I cut corners till I break it. If I help you break it, I will help you fix it...promise! Either. You guys make it whatever you want it to be. One down, who's next? iPhone 4S vs. Galaxy S II in drop test. 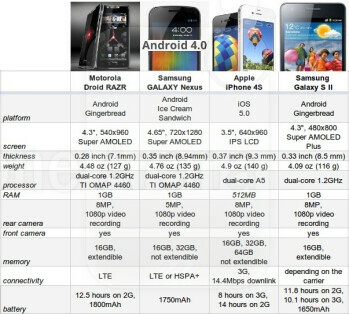 Last night, the folks at Engadget posted a handy, but somewhat incomplete feature comparison between the new Galaxy Nexus and the Droid RAZR, but this morning, the folks at PhoneArena have taken it a step further and done a SmackDown comparison that includes those two phones plus the Samsung Galaxy SII and the iPhone 4S. You can see the feature comparison in the pic below. Perhaps this will help folks make an informed decision for purchasing when ready. Which phone looks better to you? Nexus looks the best to me because of ICS, screen resolution, and potentially some battery life. I don't see the camera as a downside because the camera on the Fascy is awesome. iPhone coming in dead last because of their ridiculously tiny display and 3g. I guess it really depends on the price of the Nexus. If it is more than $199 you would be shooting yourself in the foot to get it. The negligible larger screen with the higher resolution could make a difference to some, but other than that the Razr and the SGS2 look better on paper. ICS shouldn't be a purchasing factor since the other 2 will be receiving it. I'm familiar with Samsung, Verizon, and their software updating reputation. It isn't pretty. No, it's not. But that's why we have a dev community. But it would also be Feb 2013 with the next version of Android coming out before we had a kernel source code so they could get the other half of the hardware to kind of work.